Ok, not the swamps, instead the rolling hills of northwest New Jersey but if you think I’m not going to quote The Boss when talking about our trip to Jersey well then you just don’t know me at all. Yes the Olson’s packed it all up and headed south for adventure. When I say packed IT ALL up, I mean it. It makes little difference if we are going camping or visiting family in their home, the packing remains the same. 2 days or 2 weeks and there’s little difference to the list. A CVS, across the street from a Walgreens next to a Target a short walk from where we’re staying? Ha! find me syringes, feeding tube bags, ventilator circuits, or nebulizer parts on any of their shelves and I’ll eat my hat. No, the whole kit and caboodle needs to make the trip when we travel. Actually, make that the whole kit and caboodle . . . times two. Because ventilators malfunction. Ventilator batteries lose their juice. 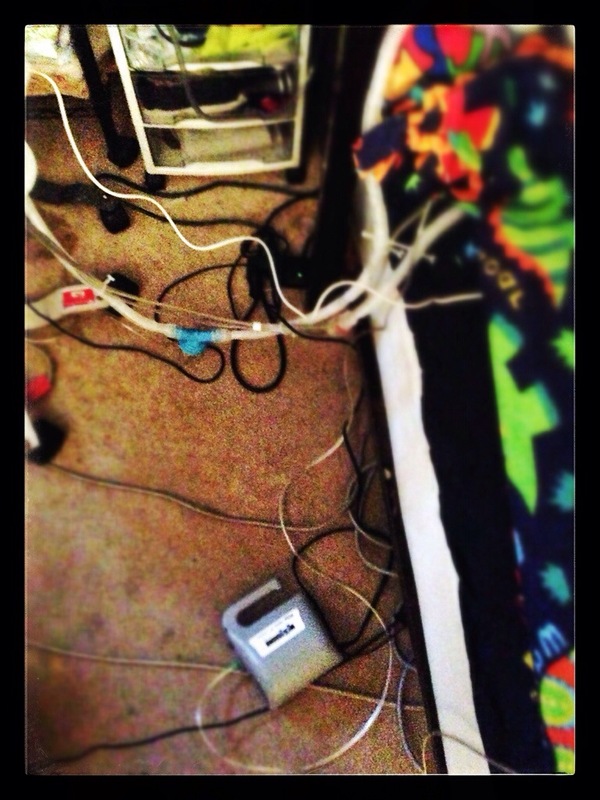 Electrical chords and plastic oxygen tubing can all fail. At any time. We have to be ready. Ready for anything. Twice over. The trip was great! We visited with family we don’t see often enough, ate good food, and had a relaxing few days away. We even took Liam to another zoo. For his part, Liam was wonderful. He endured the ride as well as could be expected considering it was RT 95 through Connecticut. He was well-behaved, turned on the charm for his grandparents, and aside from one late night with an increased heart rate that worried us until we realized it was just gas, stayed spectacularly within his baseline sats and numbers. In a new environment in a mostly climate controlled (dry) facility and only recently making a full transition off of supplemental oxygen these are not small details. I’ll be the first to admit that I get a bit nervous travelling and being away from my bubble. It makes me so proud to see how well Liam travels. I hope he keeps it up. Because along with our wonderful trip out-of-town for a few days last week, at the end of my vacation from the day job I was approached by the nursing company that supplies Liam’s home nursing care. It seems they had representatives at the conference where I spoke last month and would like to send us all to Pennsylvania so that I can speak to their national meeting of all of their pediatric nursing directors (they have offices nationwide). Details still need to be worked out so I don’t want to say too much, but they want me to speak and I really want them to hear me, so it looks like our trip to New Jersey was just a dry run for a greater adventure. About 12 hours from this writing will mark 8 days since Liam has used bottled oxygen. That’s the longest he’s ever gone without O2 in his lifetime. Last Thursday was Liam’s 4th IEP. Talk of kindergarten and adapted physical education. Goals, therapies, benchmarks and progress reports. Spring is happening and the hops are poking out of the ground. In just the last week there been so much going on that I should be blogging. Though no one’s fault at all, circumstances left us without a nurse for the past week as well. I’m not going to explain all the little things that changes for us and our routine because, again, I’m tired. Karin and I are more than capable of taking care of Liam without nursing, (Although, while I am positive that Karin would be just fine doing this without me around, the opposite is so far from true. I’d be lost) round the clock care without any breaks will wear you down. So while I’d love to blog about oxygen, IEP’s, and the need for us to learn to trust more nurses (in case our favorites can’t work), I’m tired. Liam seems to be asleep, and Netflix now has some Green Lantern cartoons that I can watch until 4am when Karin will get up and I get to go to bed. Watching cartoons is easier than blogging and like I keep saying. If you follow me on twitter or Instagram then you’ve already seen this picture but I just wanted to put this one here for safe keeping. 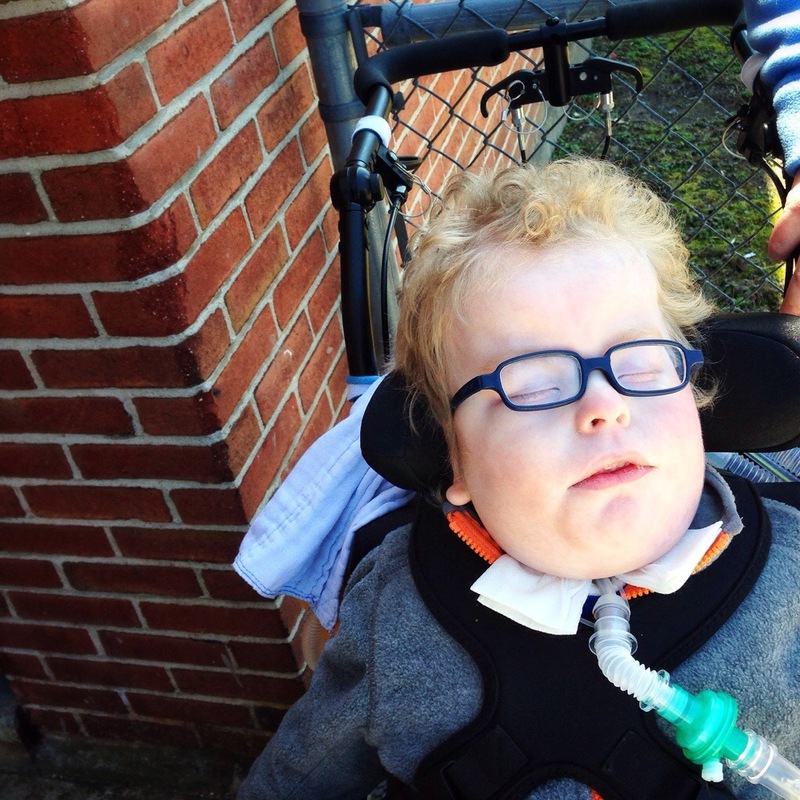 Liam likes to close his eyes if he feels a breeze. He was wide awake for this one waiting to get inside before school started. They didn’t start that way. They started as Karin’s tea roses. Barely wider than the smiley face vase they arrived in, the small plant with four bright yellow flowers was a “just because your my sister” gift from her older sister who lives in South Carolina. They immediately found a home in the front window. A window that sits just a few feet from Liam’s spot in the living room, and by default, a few feet from his ventilator. Listen, I’m pretty lazy. When the little cup needs to be emptied out every few hours (even more in the dry winter months) I could walk it all the way into the kitchen or bathroom, or I could pour it into almost anything else I can find that could fit three oz. of water like say this conveniently placed vase of flowers on the window sill. You do the math. It was over a week old when asked Karin if she was doing the same thing and it was then that we realized that this plant was not only surviving but thriving only on Liam’s breath. As a blogging parent it’s my job to over emphasize and find meaning in these little things. I mean technically most of the water is the sterile water we pour into the humidifier and even that is into his inhalation side of the circuit and not the exhalation tube but every single drop of the water given to these little tea roses spent time in Liam’s external “airway”. There are over a dozen buds getting ready to open now. At least a dozen have formed, grown, dried and fallen off. The cats took two weeks before they stopped eating the leaves when we weren’t looking. The below average temperatures we’ve had in the past month meant the radiator below attempted to kill it with heat and dryness to no avail. I’ve never seen a plant sent through the mail last this long. This plant has the strength and determination of Liam within it. We’ve only known a couple of months of life without a ventilator. In his first days enormous machines whirred and alarmed next to his isolette. They saved his life. Machines. Robots. Again at 7 months old after a few months on a nasal cannula the same huge machines saved Liam’s life again. Robots. Wiring, circuitry and plastic, can be beautiful. Liam wouldn’t be here without any of it. We have small machines at home. Liam’s machines. Wiring, circuitry and plastic. And every breath they help breath into him he breathes life into them. It can be beautiful. As beautiful as a dozen little yellow tea roses. Dirty rug. No really, go ahead and tell me how dirty it is. It’s bad enough that Karin is going to kill me for posting this. Try me. People often ask us how we do what we do. Me? I pretty much consider it a success anytime we don’t trip on something. Rare Disease Day was this week and I did nothing here to commemorate it. I’m terrible with those things and don’t even know they are happening until the morning of, when inevitably someone will mention it in my twitter feed. The week before last was National Tubefeed Awareness week or “Tubey” Week but even though Liam has been tube fed his entire life, you wouldn’t have heard that from me because, like I already said, I’m terrible with those things. Anyway, I’m falling back into that trap where blog posts need to encompass some grand idea or story and so I’m trying to head it off at the pass. 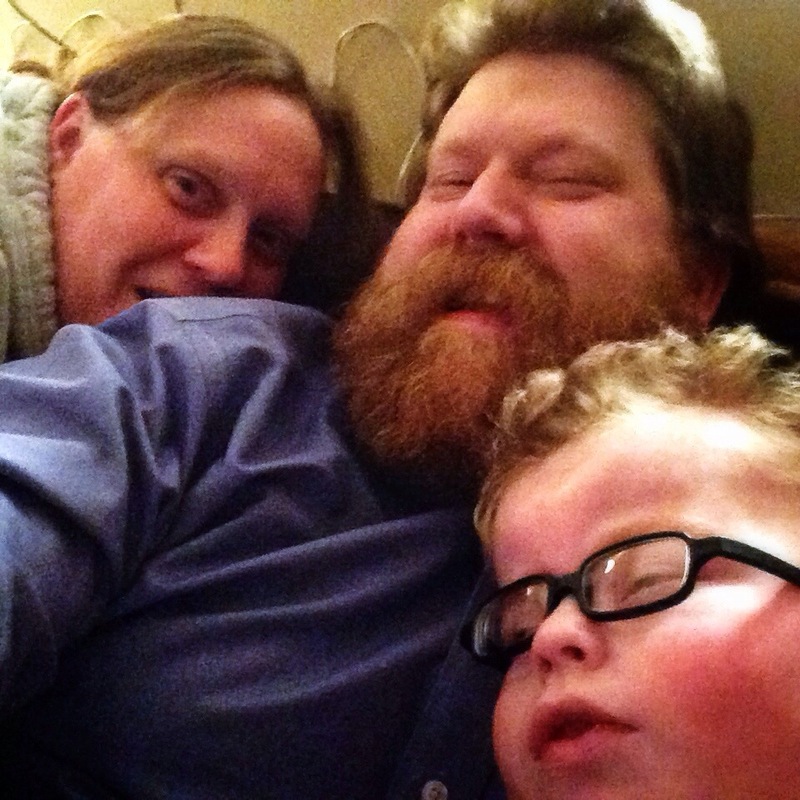 Parenting Liam while exciting at times isn’t all big revelations and medical emergencies. Most of the time it’s just getting through the day to day like anybody else. Like going to the dentist. Liam handled it better than I did but in the end the dentist’s final words were “whatever you’re doing, just keep right on doing that because everything in there looks exactly as it should.” so, we’ll take it. Due to Liam’s annual month-long hospital stays and other illnesses, then throw in a half year on blood thinners, and this was Liam’s first ever dental appointment. Thanks to prematurity, not eating food by mouth and breathing not by mouth but by ventilator (causes the gums to become more fibrous making it more difficult for teeth to break through) the delay was not a problem because Liam, in essence, still has the mouth of a two year old. Which is why at this very moment of 2:12AM instead of sleeping peacefully, he is fitfully tossing and turning in the pain of yet even more teething. There isn’t enough Children’s Motrin in the state, the teething just doesn’t stop around here. Ever. Might be time to switch to a bit of Whisky on the gums. . .
and time to try something new for Liam’s teething pain also. I’m generally not the guy to post news, be it good or bad, as it happens. It took me a week to post about taking Liam onto the field at Fenway before his first game there, a truly life changing moment, so the timing of this post alone should explain its importance. In only minutes Liam’s new night nurse will arrive for her first overnight shift. She has trained here with Liam and his daytime nurse for 30 hours and so, she is comfortable with us. She seems competent and confident, she is gentle and sweet with Liam and even talks to him (which you would think wouldn’t make her special when it comes to nurses but we’ve found that not to be the case). She seems to be happy to work nights and has given no indication that this is just a placeholder job until something better comes along (also a common theme found in overnight nursing). In other words, she was sent from above. September 4th. The last time I went to bed before 4am. The last time Karin was able to sleep past 4am. The last time we slept in the same room. In only minutes it will come to an end and we can take a deep breathe and get some rest. So it’s going to be pretty funny when neither of us get any sleep at all. It will take a while until we get used to trusting someone new to take care of Liam without either one of us. Even if it is overnight. Get some sleep out there folks. I know we are going to try. Too Hard to Choose. A blog post photo album. I’m the guy that you don’t want to go to a bookstore with. Same went for going to the video store back when they existed. I’m not good with choosing. I walk around pulling titles off the shelf and instead of thinking “this looks like a good read. I’ll get this.” I usually think something more along the lines of “hmm, Looks pretty good but if I keep looking there’ll be something even better” which only ends with me carrying 5 or 6 books and trying to narrow them down to one while Karin sternly tells me to just pick one because she’s been patiently waiting for a half hour and it’s time to leave now. Anyway, that’s just books and videos. I’m just as bad with online shopping. I’ve had an iTunes gift card since my birthday in October that still sits unused because I can’t decide between getting some older albums that I’ve always needed or branching out and picking up something new from an artist I’m not that as familiar with. It’s pathalogical with me. I’m nuts. But again, were talking about records, songs. How can I be expected to choose from something that actually means something to me? Something deeper than a mere appreciation. Weeks ago a friend ended an email with the post script “What is your single favorite picture of Liam?” and because I’m a terrible friend I still haven’t answered him. Should it be one of the FIRSTS? The First time we saw his face without tubes or tape. That's his first peice of clothing as well. And that hat? Yeah I wore that almost every minute of our time in the NICU. My Nan made it for me and gave it to me for Christmas the day before Liam was born. It became my security blanket for about 5 months. Does Liam have to show his face in the photo? Or should he be all alone? Or should I be really selfish about this and choose a picture of Liam giving me specifically that great big smile of his? How could these next two not be my favorite? As SECOND favorite??? I don’t think so. What about Halloween? After close to two years of calling him Liam the Lion to see actually see him as a lion was amazing and I love looking back on these. Even if he didn’t like wearing the headpiece. He generally doesn’t like head wear but he tolerates it for his Mom and Dad. So Ken, I’m sorry. I just can’t do it. I can’t decide on a favorite because it is always changing. But today? Today at this moment if you were to twist my arm and force me to choose my favorite picture of Liam, I’d have to say it is the one that his mother just took. 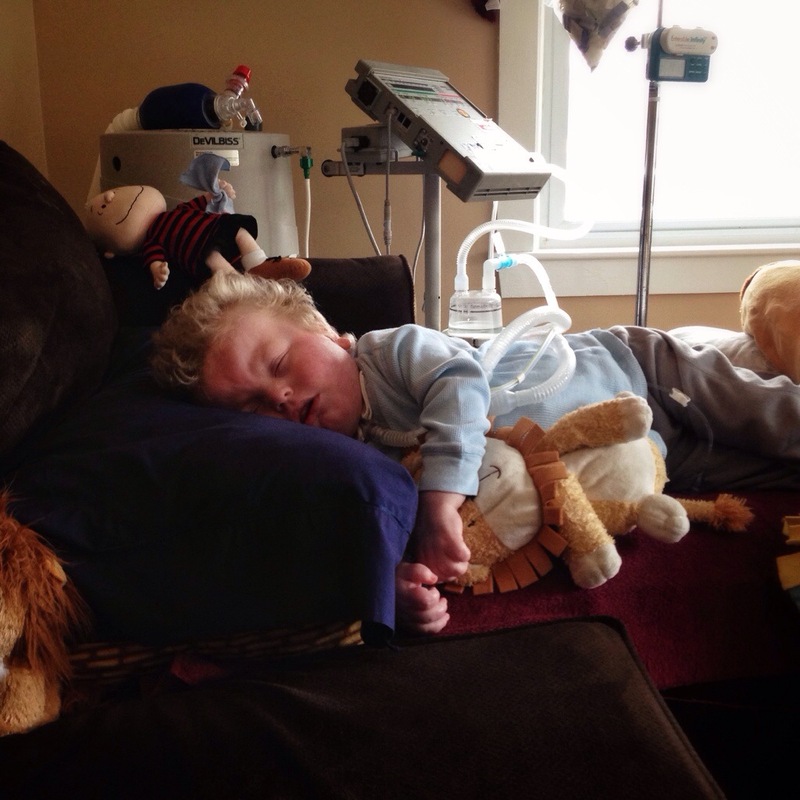 Liam NOT attached to his ventilator. Free from his machine (which longingly looks on over his shoulder) and smiley as ever. Today, this is my favorite. But ask me again tomorrow. It’ll be something completely different.